Seville is full of history but also tradition and legends. Every street, every building hides a treasure, a soul. We have a famous saying : “There are three Thursdays in Seville that shine more than the sun, Holy Thursday, Corpus Christie and Ascension Day” This last feasts are celebrated also in Thursday. Corpus Christie is a big day for Seville and some children dance at the Altar in the Cathedral. This dancers are called “Los Seises” . “Seis” means number six in spanish because there were 6 children dancing a very old dance since 16th Century. But this tradition takes place also the 8th December, the Feast of the Immaculate Conception and the children (Los Seises) are dressed this time in blue. Unknown when they exactly started dancing but there are references to this from the early sixteenth century and the children did sporadic during the Corpus Christie procession. In the 17th century this habit becomes a Christian tradition of the city. In 1654 it was decided to provide the feast of the Immaculate of that honor in 1695 and will be the same with the Triduum Carnival. The costume is very striking with gold, tights, baggy pants and jackets. Curiously, the suit incorporates celestial details on the feast of the Immaculate sow and dancing with a hat with feathers. Nowadays there more than 6 children, but it still remains the same name. 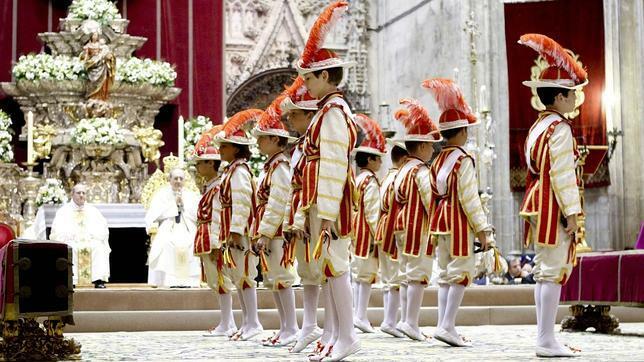 The children’s choir of the Cathedral, the College of Portaceli, sings accompanying dance.